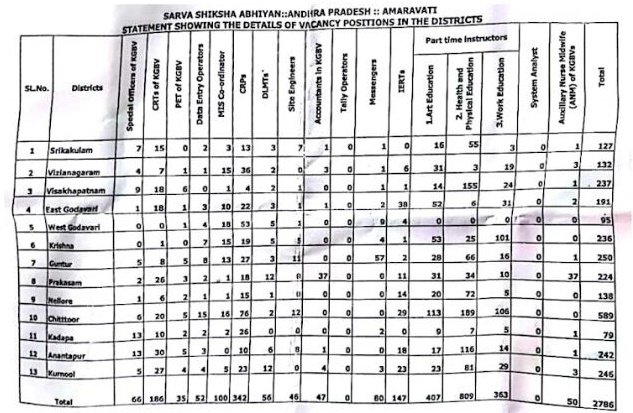 AP SSA Contract/Outsourcing Recruitment total Vacancies 2786 Posts for Special Officers/CRT Telugu/Hindi outsourcing Basis Notification/Vacancies Guidelines Instructions Eligibility criteria Download/AP Sarva Shiksha Abhiyan Amaravathi (SSA) Contract/Outsourcing for the post of Special Officers/CRTs/CRT Telugu/ CRT Hindi outsourcing Basis Notification/Vacancies Guidelines Instructions Eligibility criteria and more Information. A large number of posts are lying vacant at the field level and these posts are meant to be filled on outsourcing basis. Further, all these posts have to be filled up immediately to implement the approved activities along with the provisions of RTE Act as per the time line specified in the Act. The following guidelines are issued to fill up these posts at district level. nominee of the District Collector. category posts on outsourcing basis is as per the guidelines. The District Level Committee shall ensure that the outsourcing agency shall follow the Rule of Reservation as prescribed in the A.P. State Subordinate Service Rules, 1996. Further, it shall also be ensured that Ij3rd of every category to the extent possible will be filled up by Women candidates. outsourcing agency notified against each district. communicated to the outsourcing agency. keeping in view the reservation and allot the candidates in the identified schools. particular District as shown in the Annexure- 1. The duration of the outsourcing agency depends upon its performance to be evaluated by the District LevelCommittee from time to time. Get Download Eligible Cretaria Guidelines Instructions Click Here. Get Download Vacancies list Click Here.